Sinking organic matter: a major driver of the oceanic zinc cycle? Zinc (Zn) is a marine micronutrient, important for phytoplankton and involved in biogeochemical cycling throughout the oceans. Despite the importance of this element, the processes that control the oceanic Zn cycle are still poorly understood. As with other trace elements, this lack of knowledge is being addressed by high-resolution sampling as part of the GEOTRACES program. A new study by John and Conway (2014; see reference below), presenting the first high-resolution coupled profiles of both dissolved Zn and cadmium (Cd) concentration and isotope ratios from the GEOTRACES North Atlantic (GA03) section, suggests that scavenging of isotopically heavy Zn onto organic matter plays an important role in the surface marine cycling of Zn, and may be important for understanding why Zn, like silicon (Si), has a deeper regeneration in the oceans than nitrogen (N), phosphorus (P) and Cd. 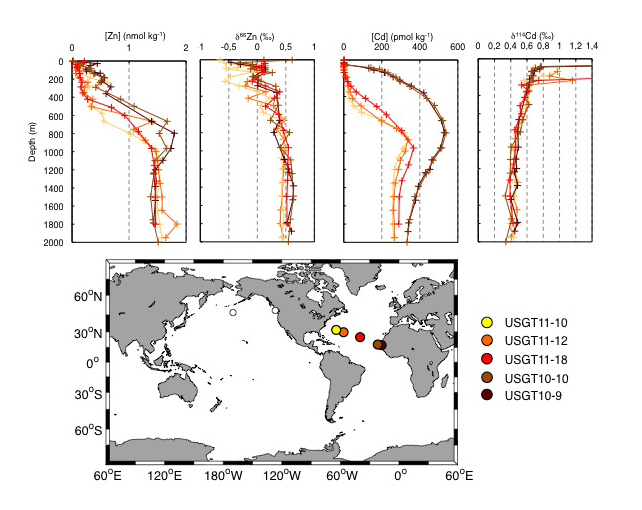 The new GEOTRACES data is supported by modelling and culture experiments, which show that whilst Cd and major nutrients are quickly released as phytoplankton degrade, a significant portion of the Zn is instead scavenged back onto organic matter. Figure: Zn and Cd concentration and stable isotope profiles along the North Atlantic GA03 section. John, S. G., & Conway, T. M. (2014). A role for scavenging in the marine biogeochemical cycling of zinc and zinc isotopes. Earth and Planetary Science Letters, 394, 159–167. doi:10.1016/j.epsl.2014.02.053. Click here to access the paper.